PicoTrim is servo controller that shows you it's position on a graphical display. You use a two-way switch to click it up & down, and the LEDs move in sync with the servo position. This was made for a friend to use on his ultra-light planes to control the Trim flaps like a 'cruise control' on small planes. But it can equally be used for Halloween costumes, party games, and automated mechanisms. You just need a servo, a two way switch, and some batteries. If you want to use this in cars or planes you can get the optional high-volt diodes to protect from unwanted voltage strikes. With longer wires the servo motor can be mounted out sight, but you still know where it is because you put the 12 LED graphical display where you are. It's got a pre-programmed PIC micro, but you can also re-program it in the ASM and C programming languages. And you can even customize it with flowchart programming software called PicoFlow Alpha (PicoFlow USB Programmer required). 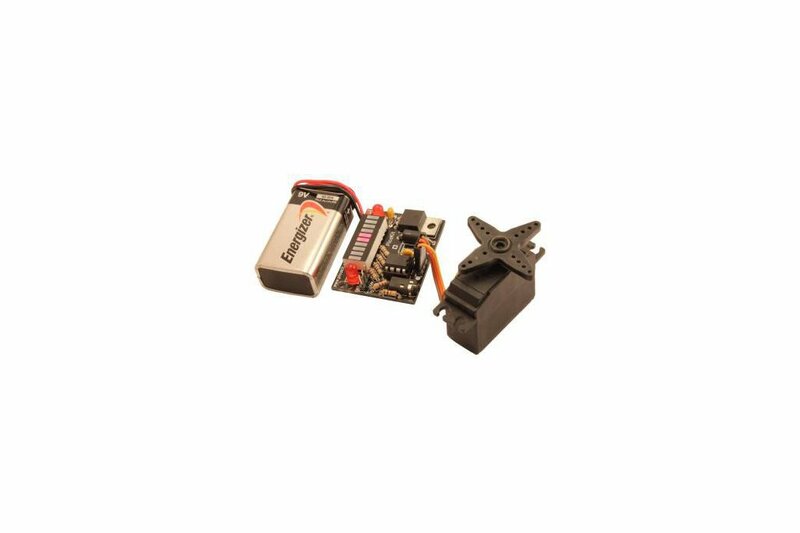 The voltage regulator works between 6 volts and 33 volts, and if you want the high-voltage protection, it covers both the 33 Volt input and the 5V output voltages. Note: Servo, Battery, and Switch are not included.